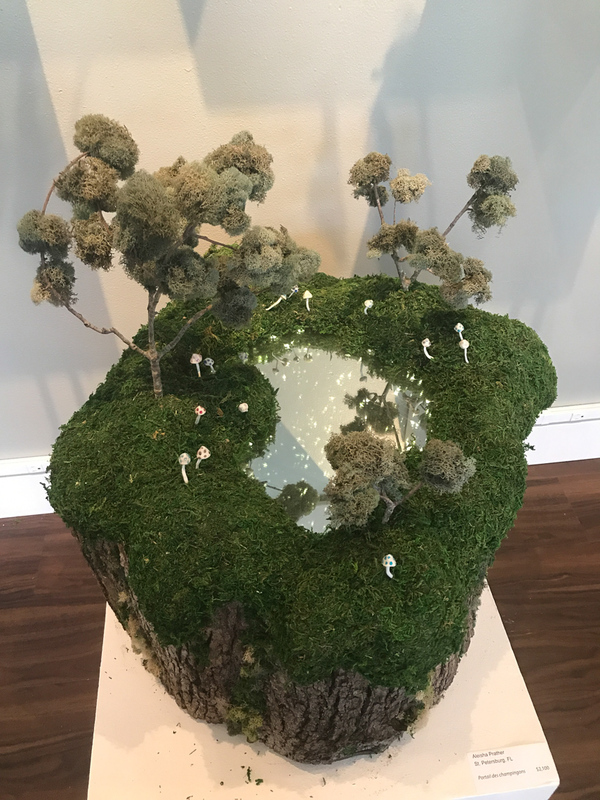 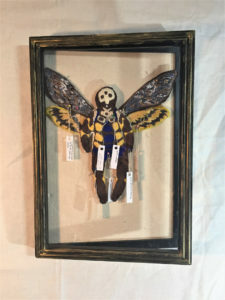 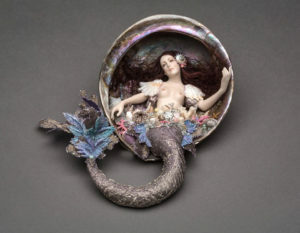 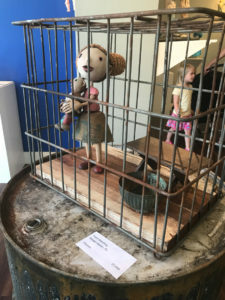 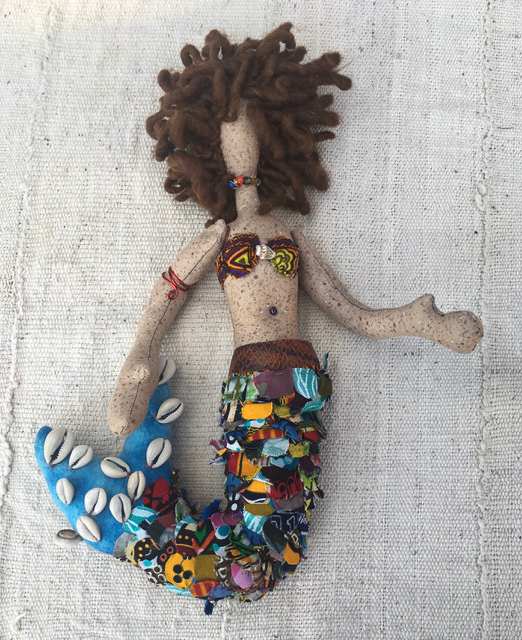 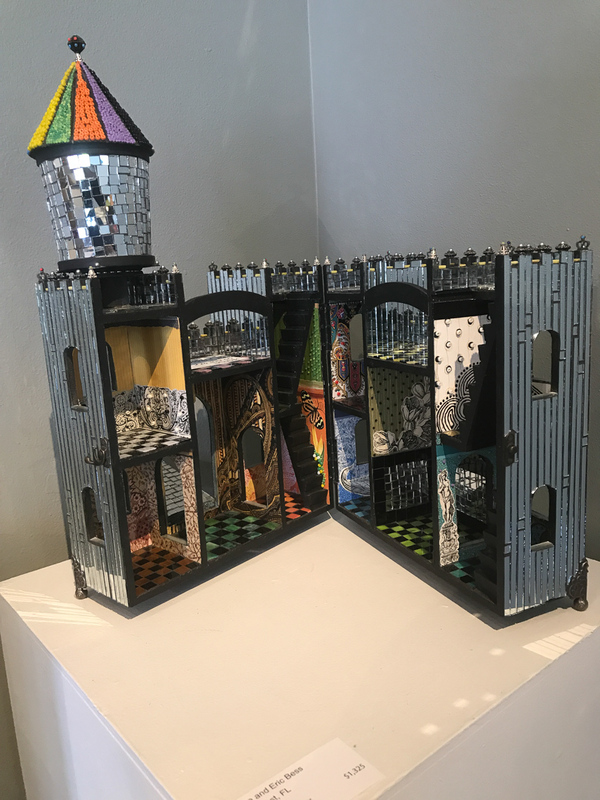 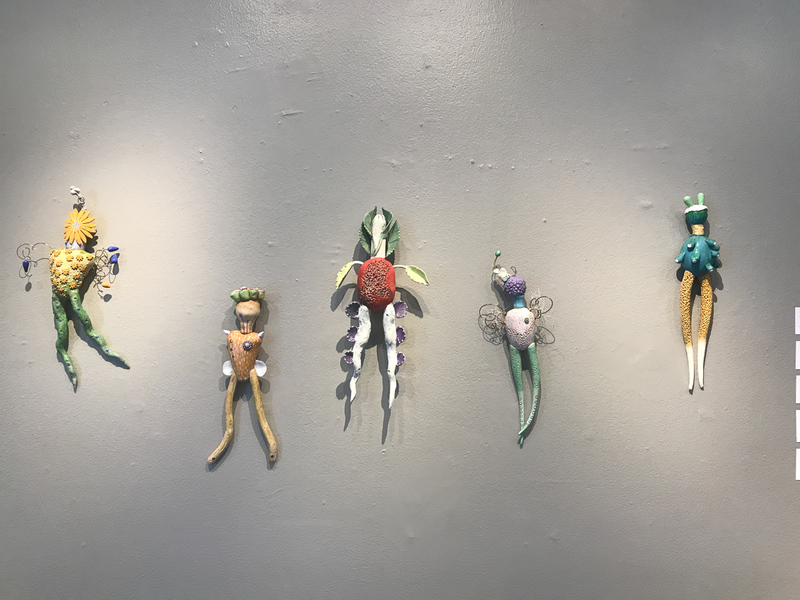 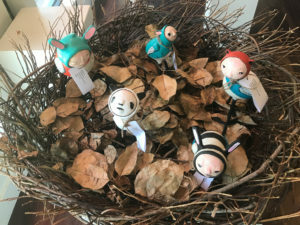 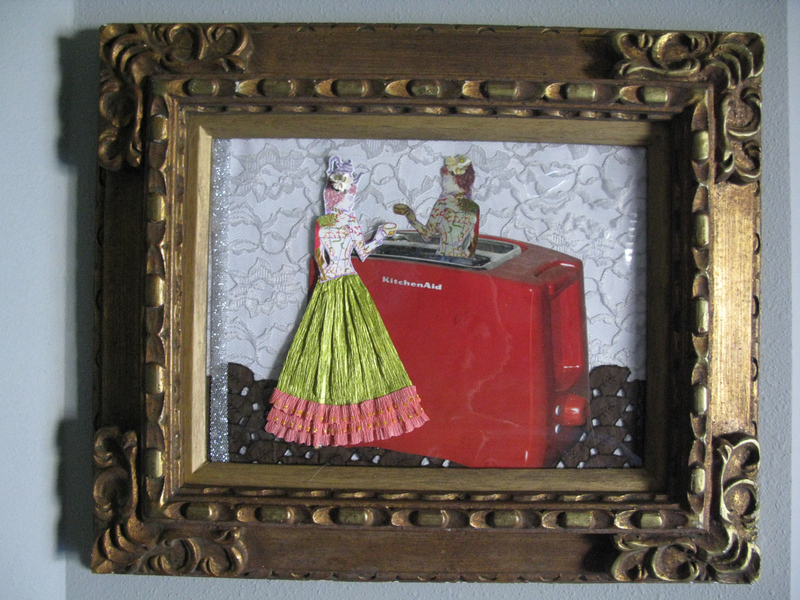 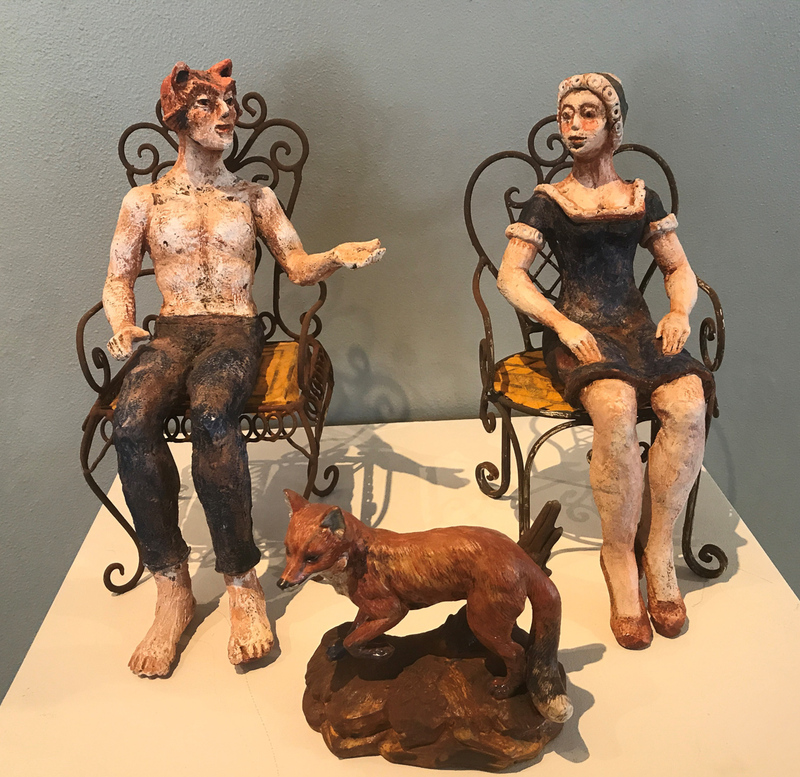 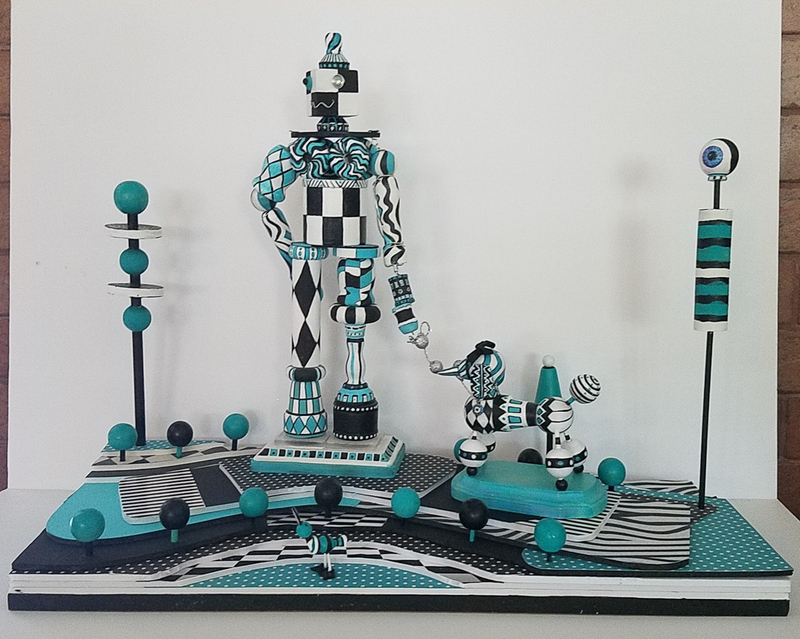 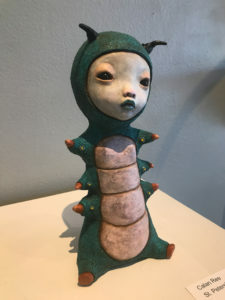 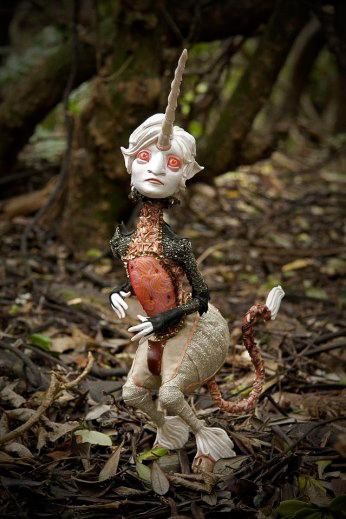 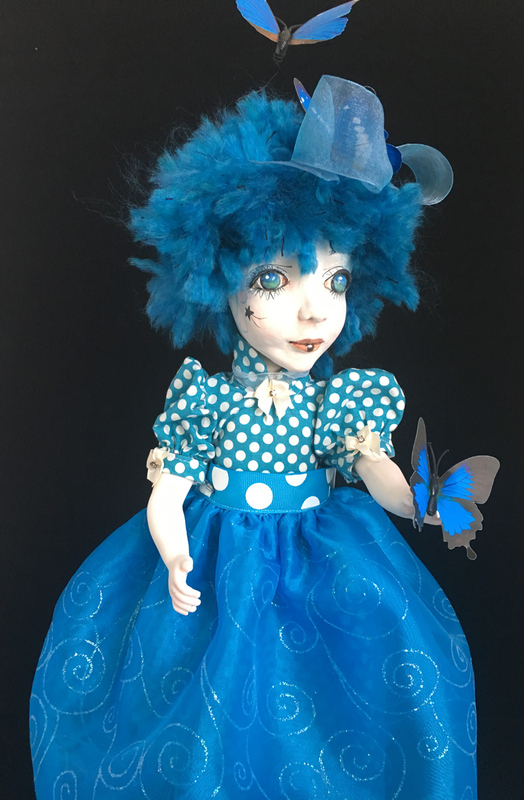 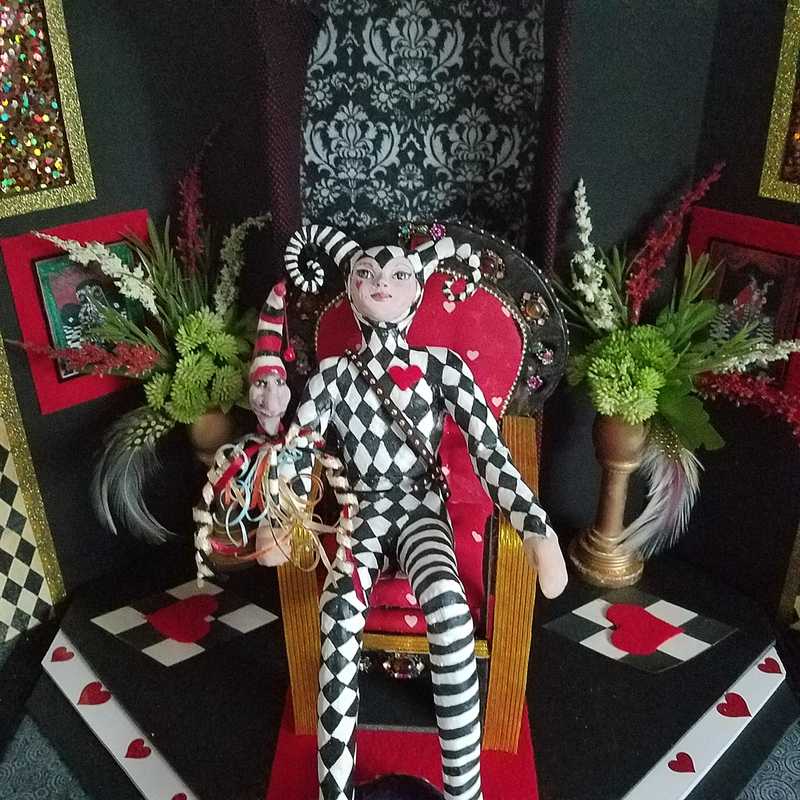 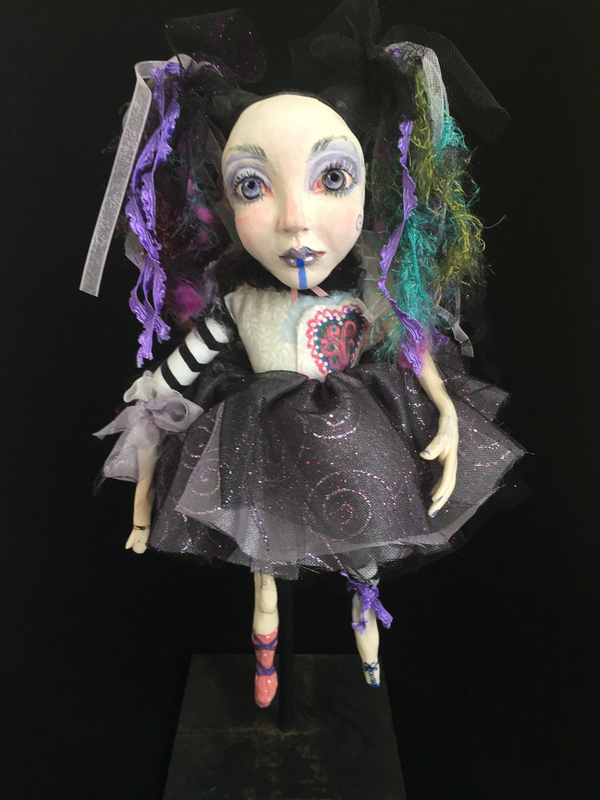 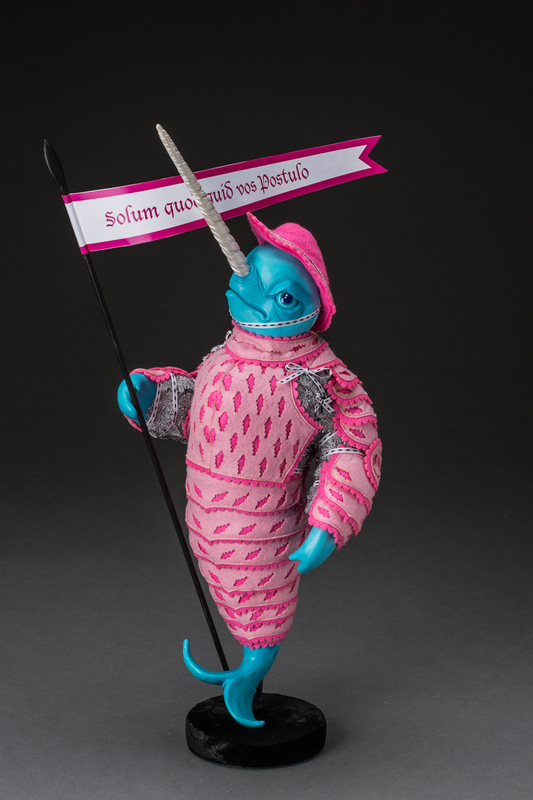 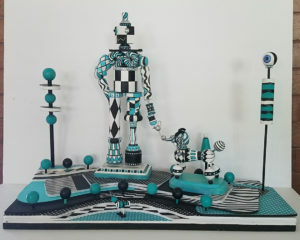 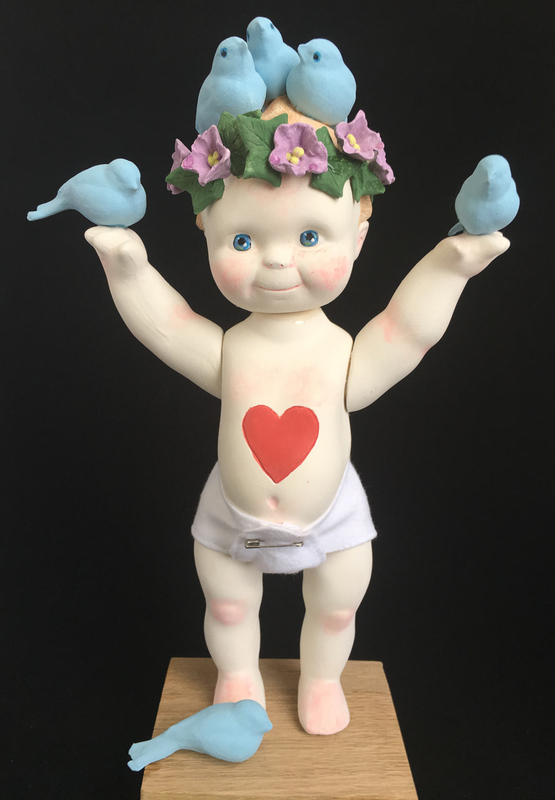 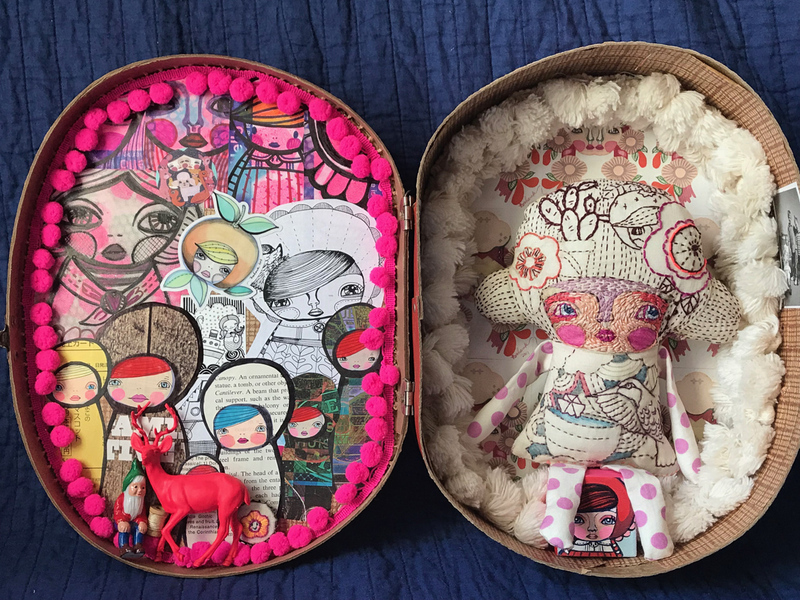 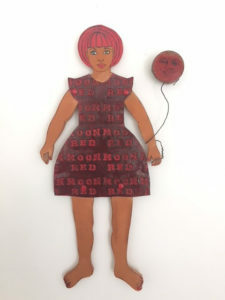 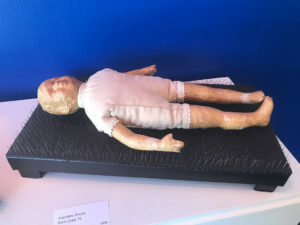 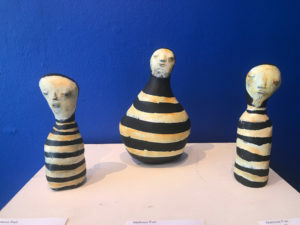 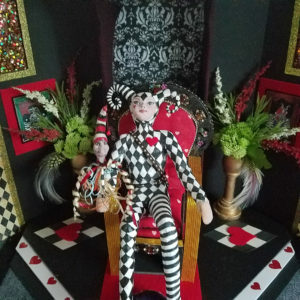 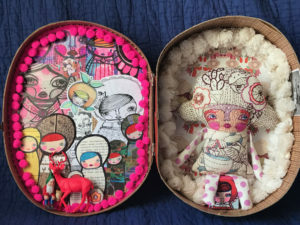 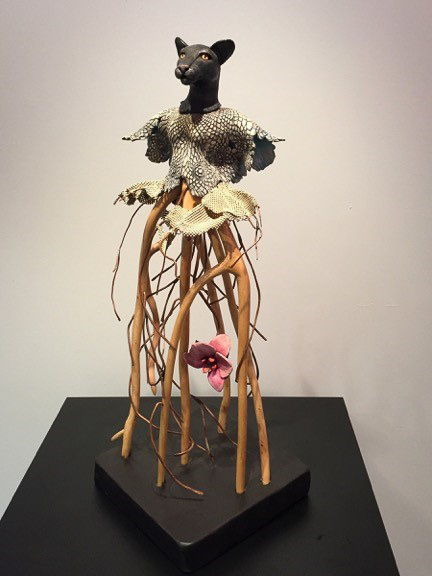 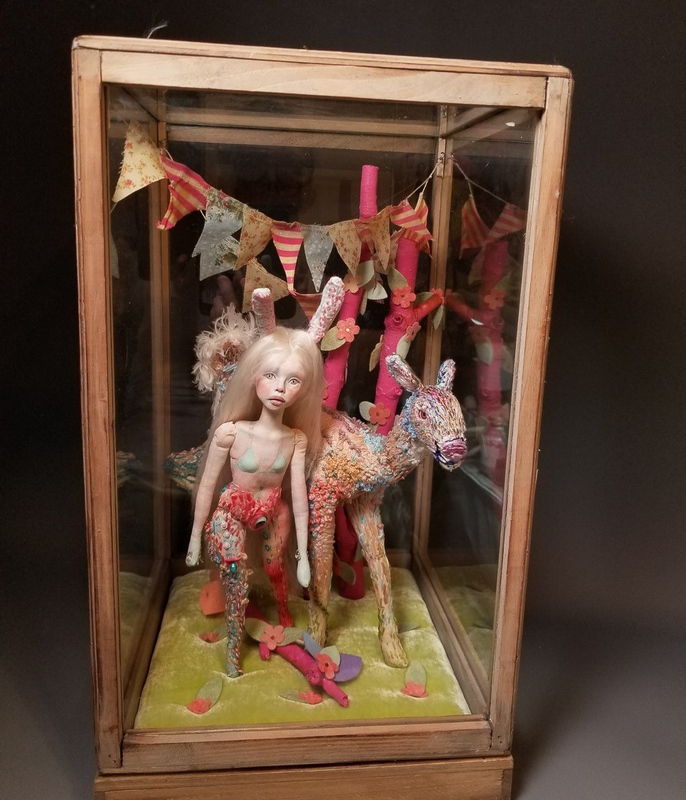 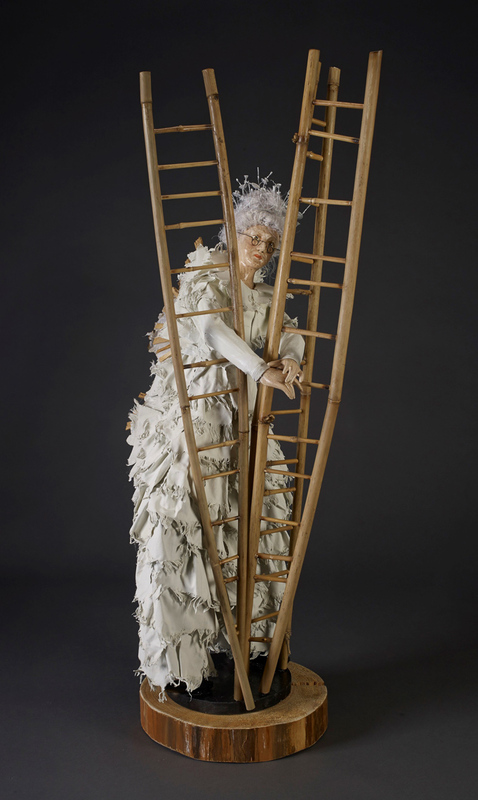 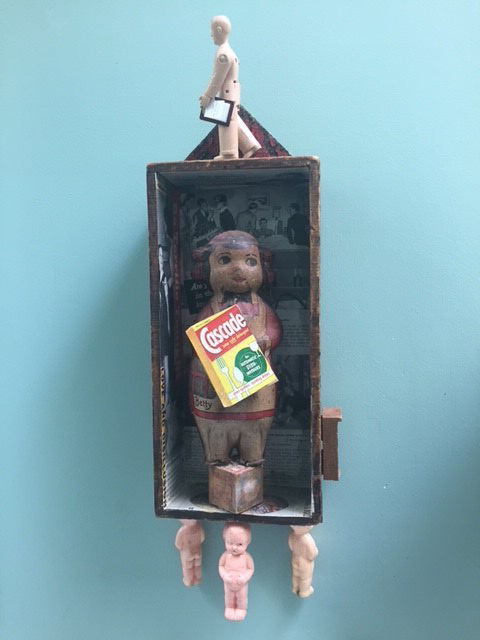 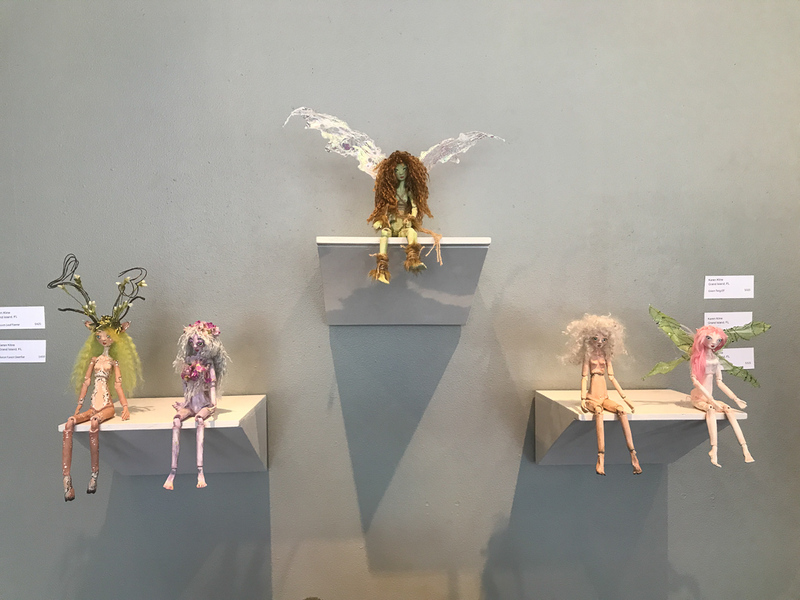 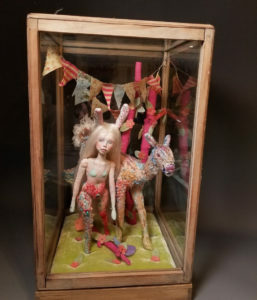 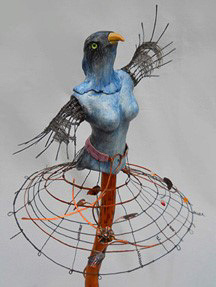 Artist-made dolls from sweet to gothic to outrageous in environments suggestive of where the dolls might live are in Florida CraftArt’s Exhibition Gallery through July 28. 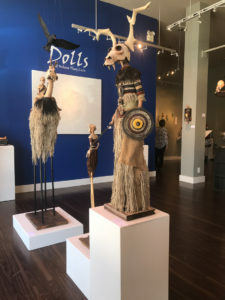 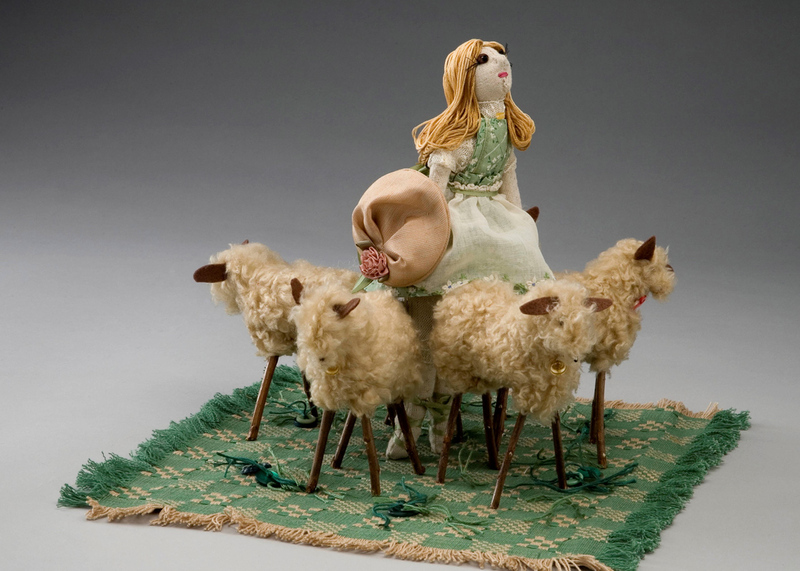 Dolls were fashioned and submitted by over 30 artists including members of the National Institute of Doll Artists, artists from around America and from as far away as New Zealand. 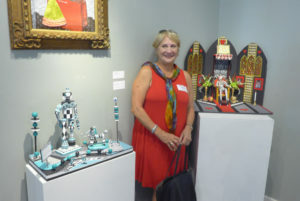 The exhibition was judged by Loretta Nardone, President of the United Federation of Doll Clubs (UFDC) an international organization with more than 8,000 members. 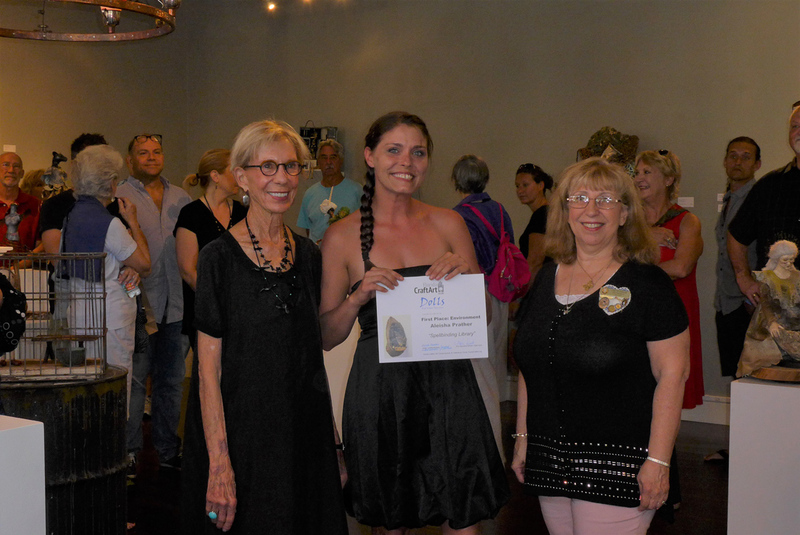 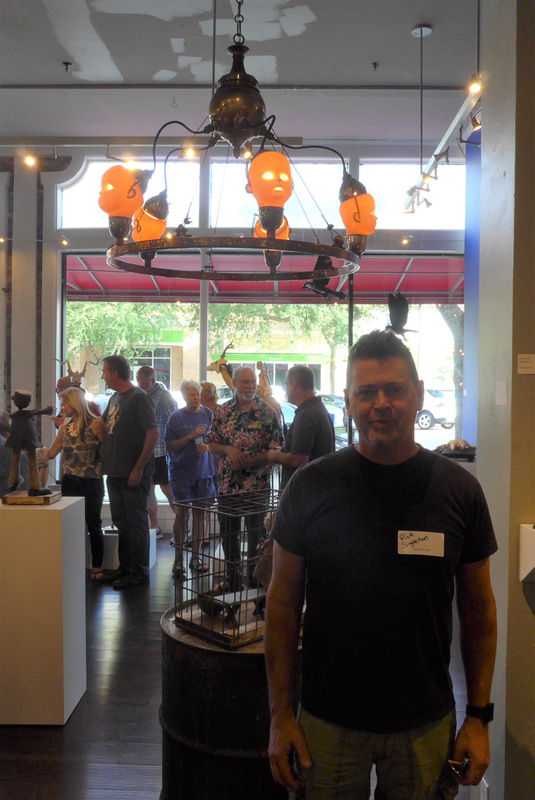 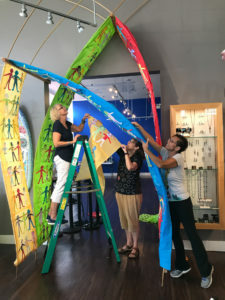 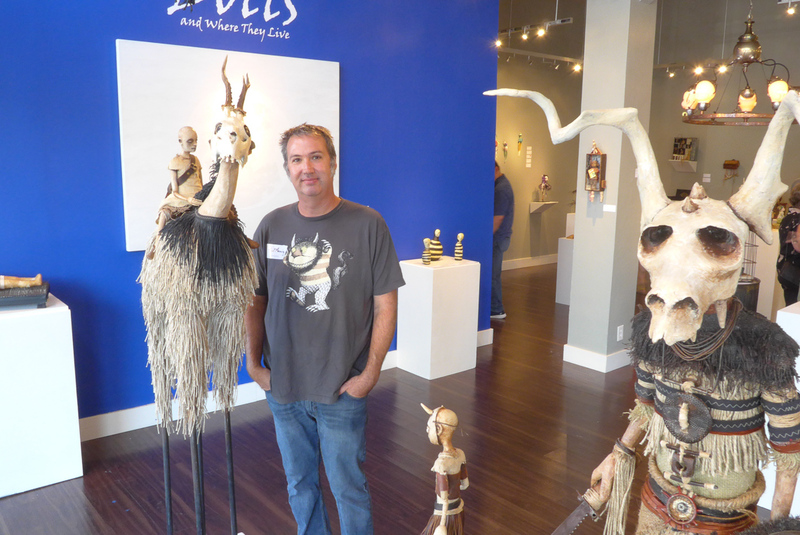 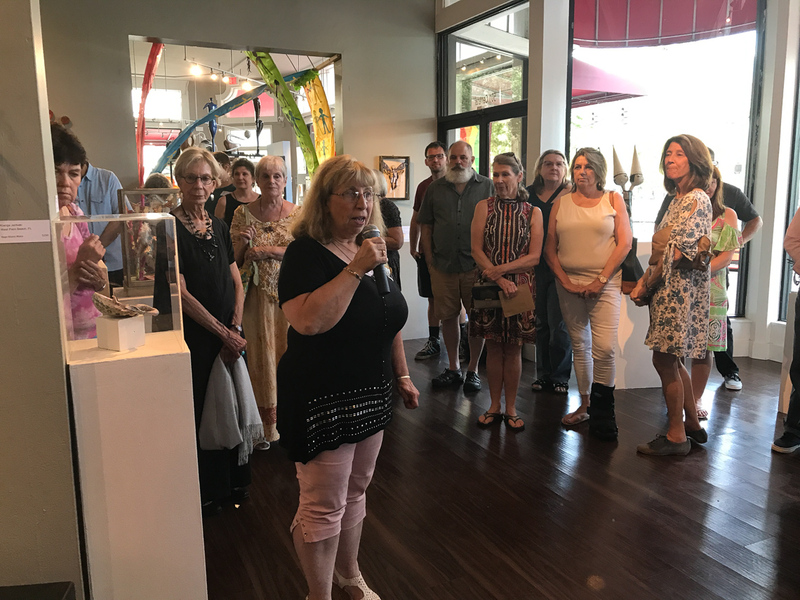 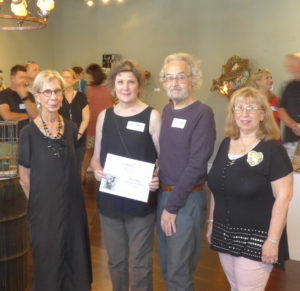 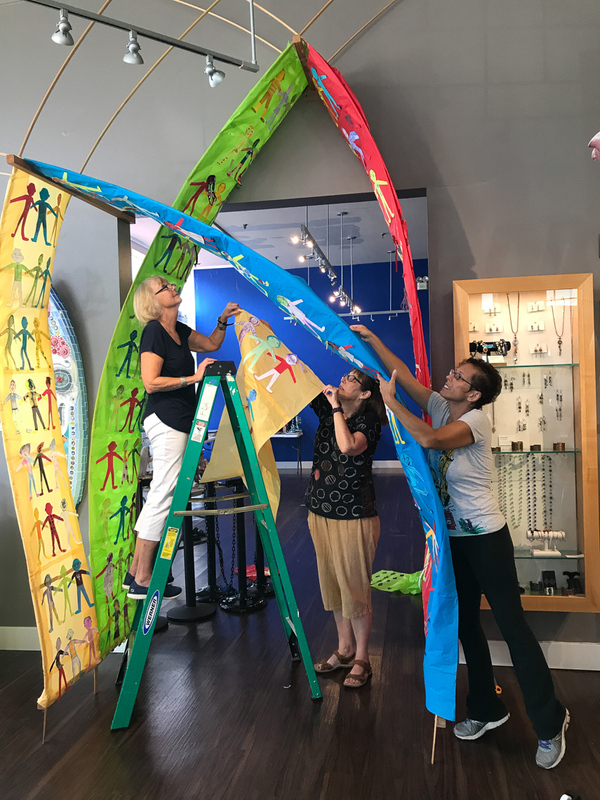 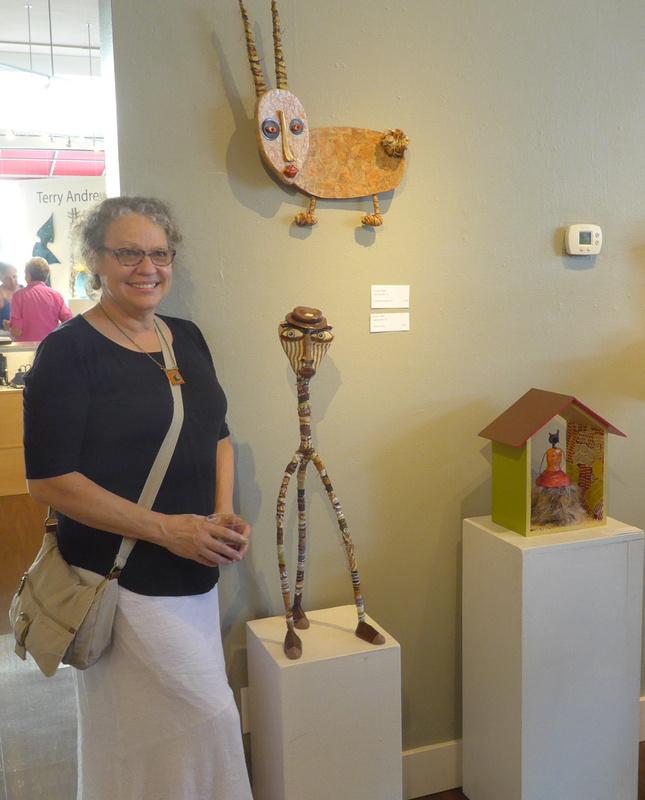 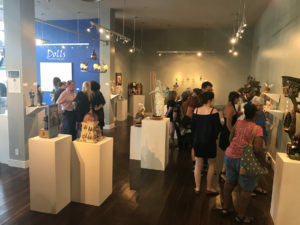 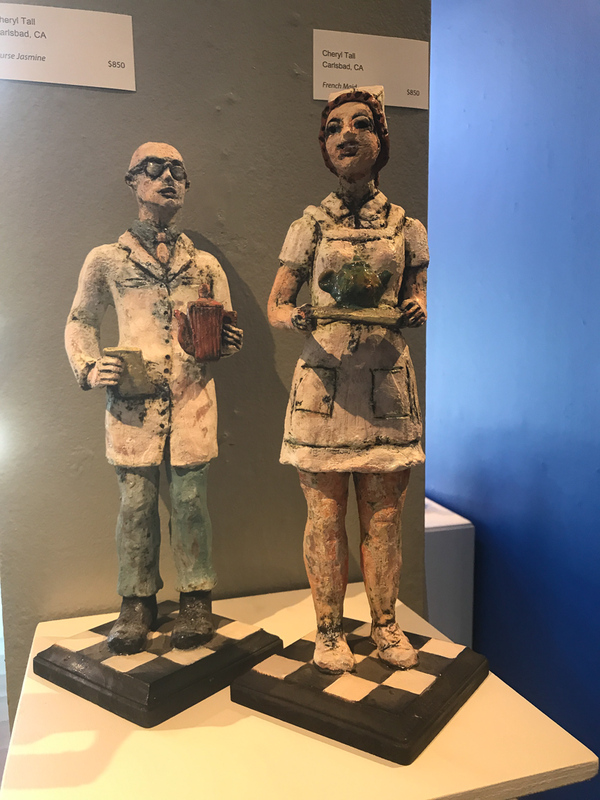 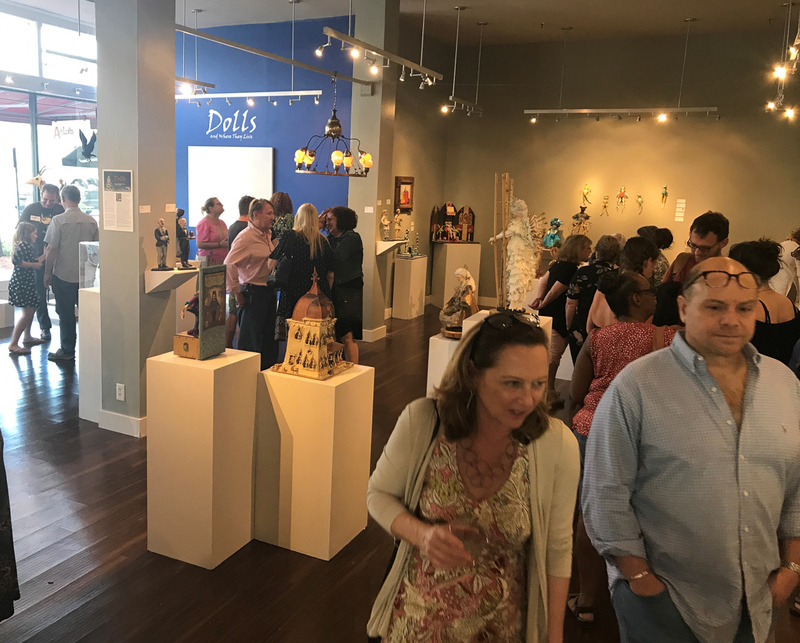 The awards presentation was Friday, June 8, from 5:30 to 7 p.m. at Florida CraftArt located at 501 Central Avenue in St. Petersburg, Florida. 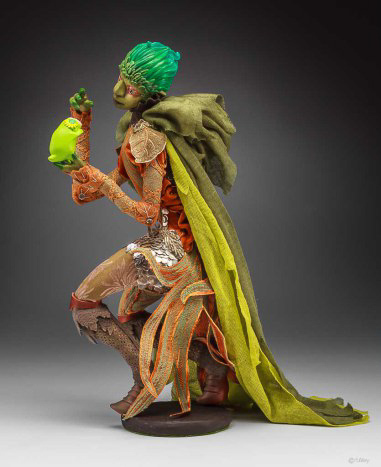 In the doll category, Trent Manning (Winter Haven) won first place for his fierce 4-foot-tall doll “Dragon Slayer. 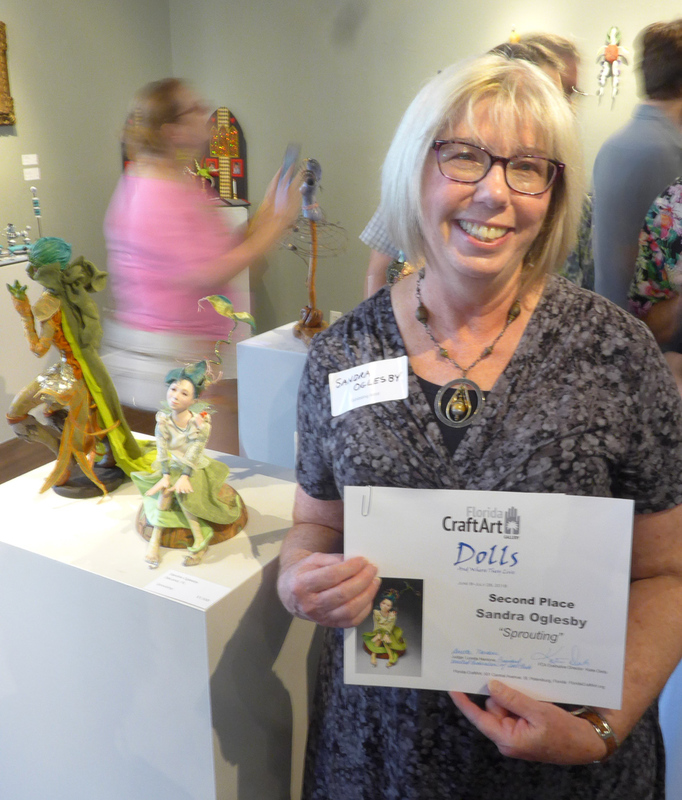 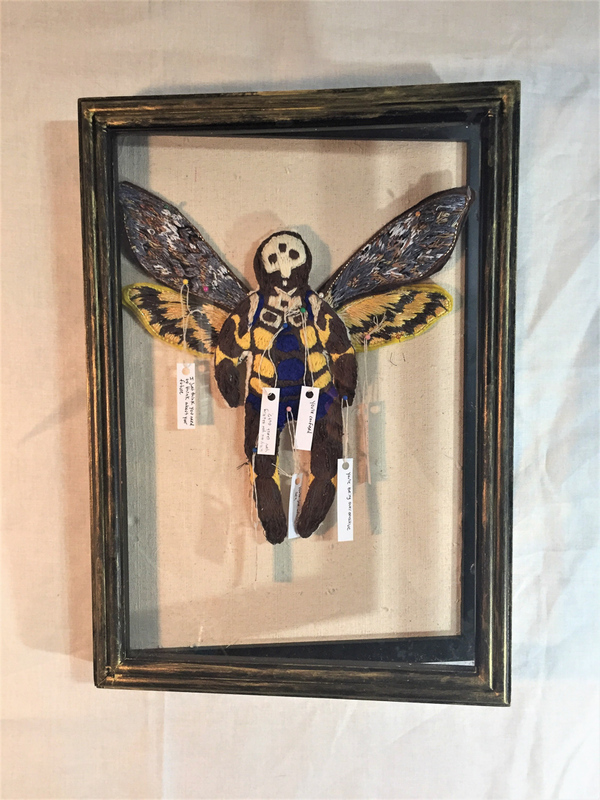 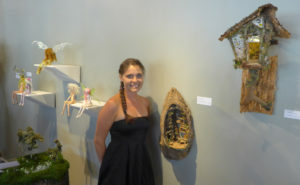 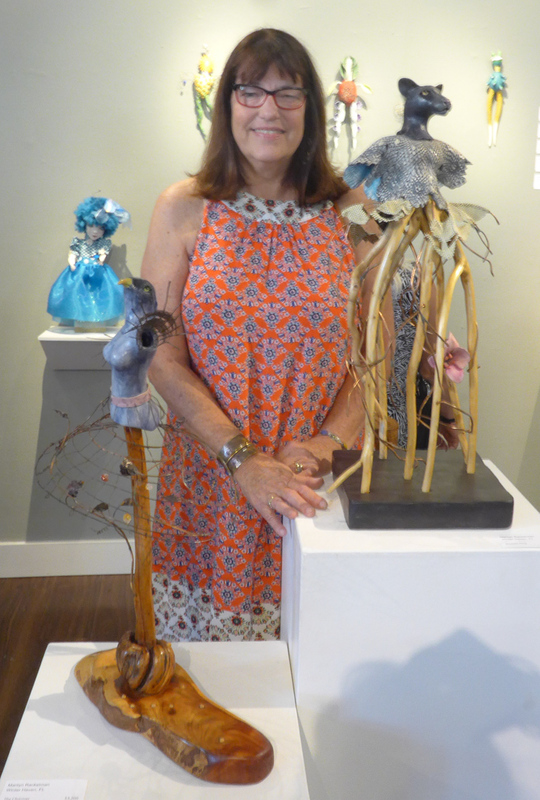 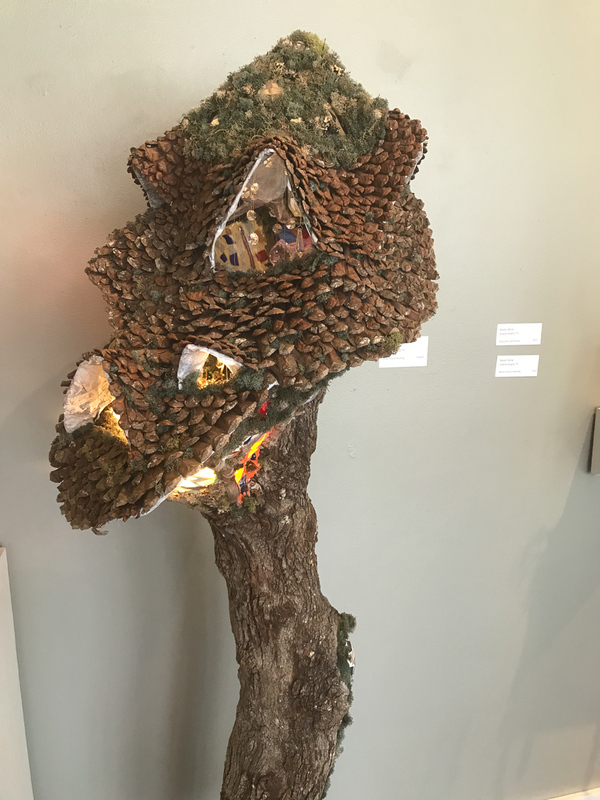 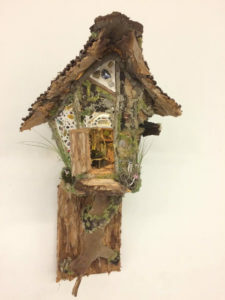 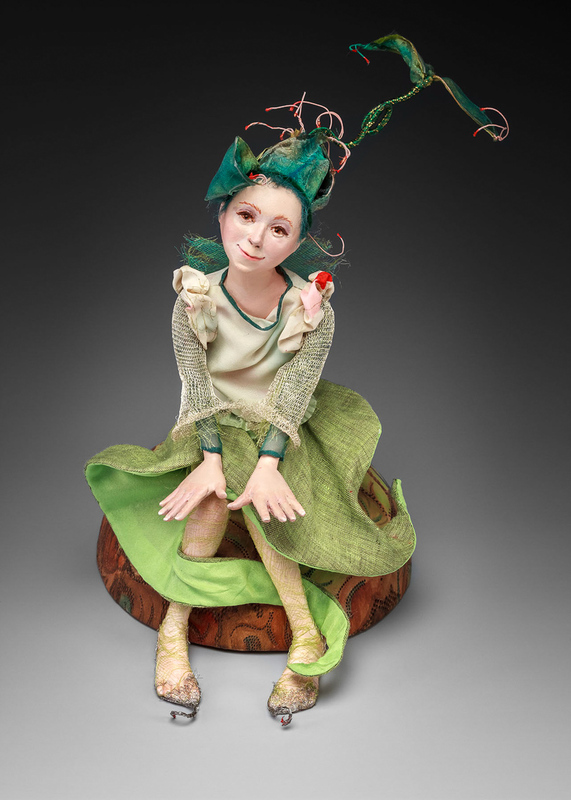 Deland artist Sandra Oglesby received second place for “Sprouting,” an adorable fairy-like creature. 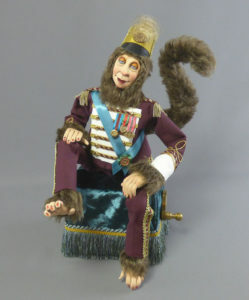 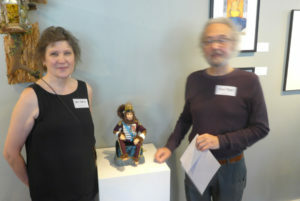 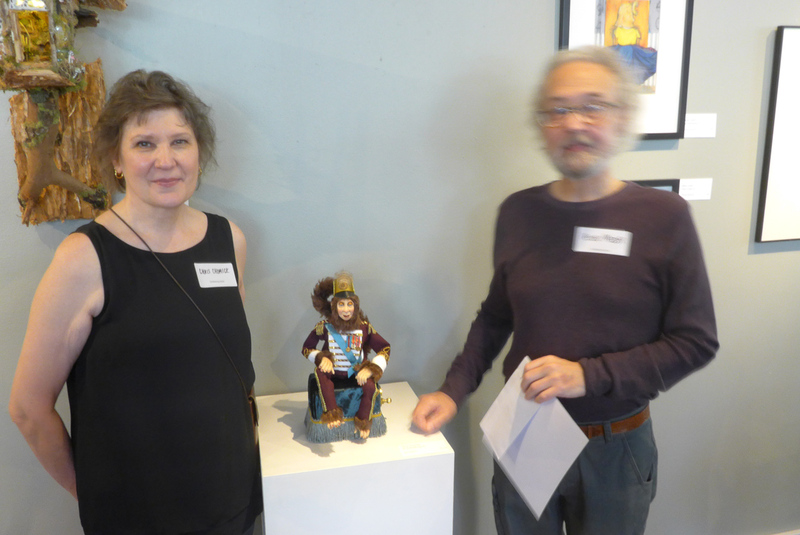 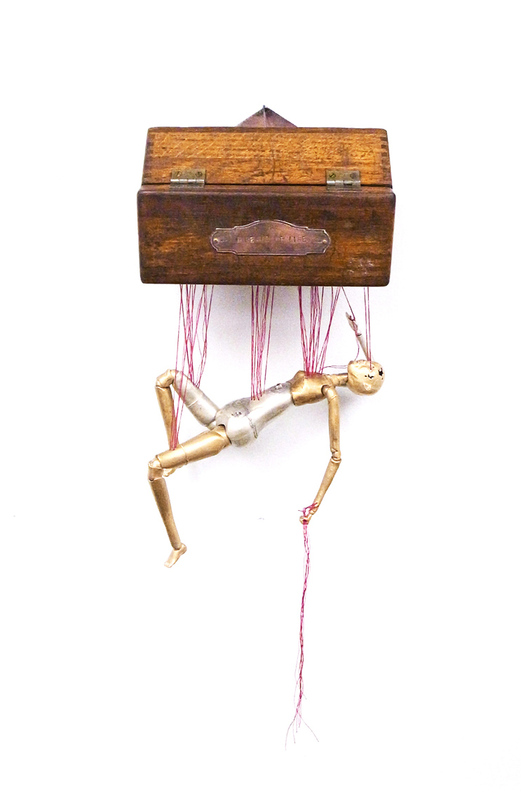 St. Petersburg artist Chris Chomick was awarded third place for “Prinz Bobo,” a monkey automaton. 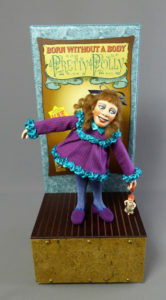 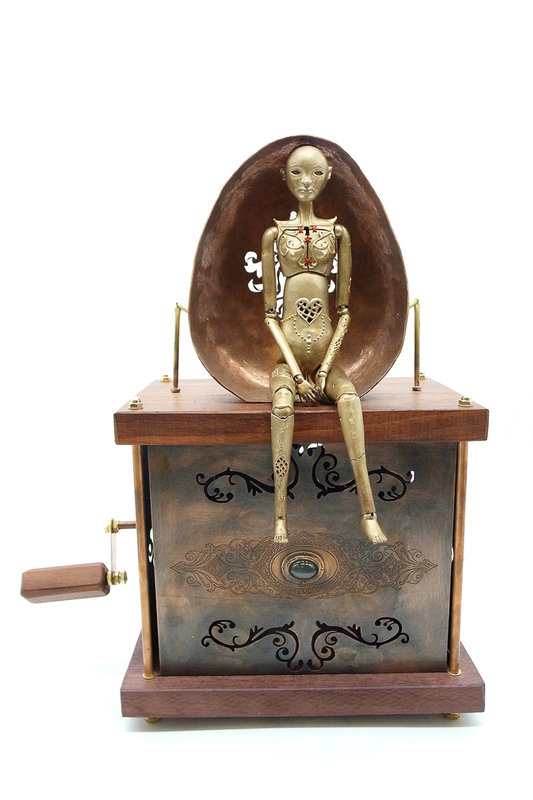 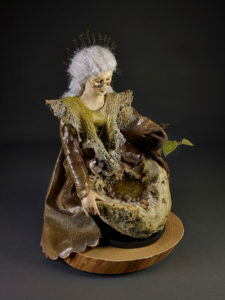 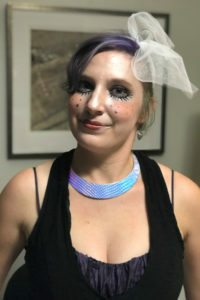 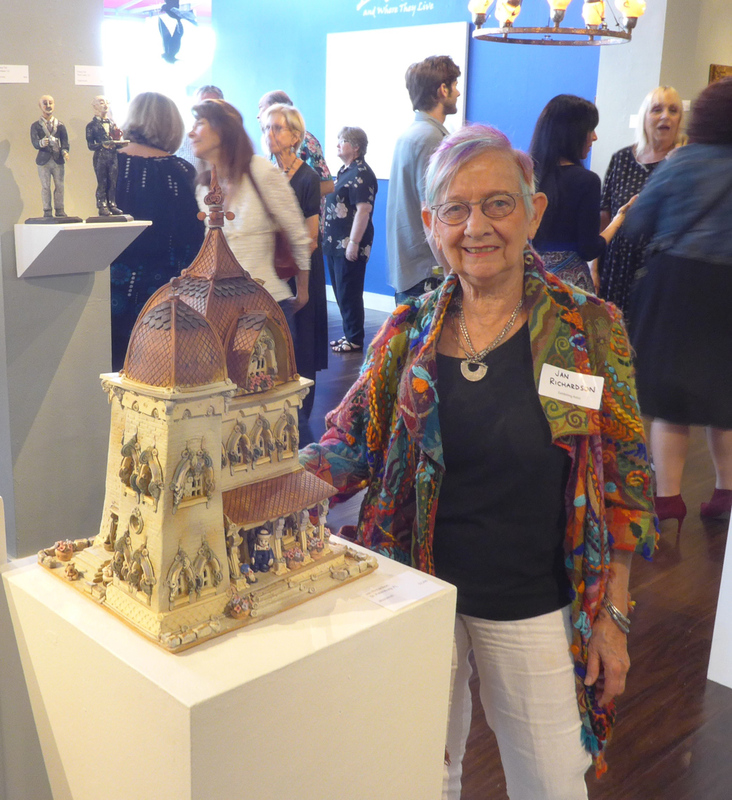 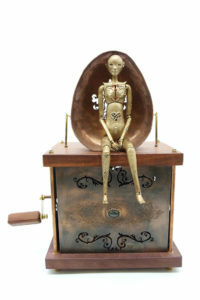 Chomick and her husband Peter Meder have been featured in various national and international art doll and automata publications and are included in many private collections around the world. In 2018, they were given the golden Max Oscar Arnold Award in “Category 13, the best overall work of an established artist” by the Cultural Council of Neustadt bei Coburg, Germany. 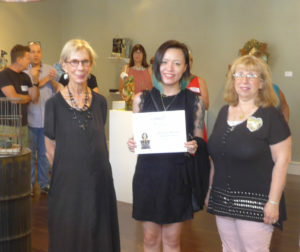 Honorable mentions were given to Victoria Rose Martin (Lake Worth) and Yolanda Chui (Gainesville). 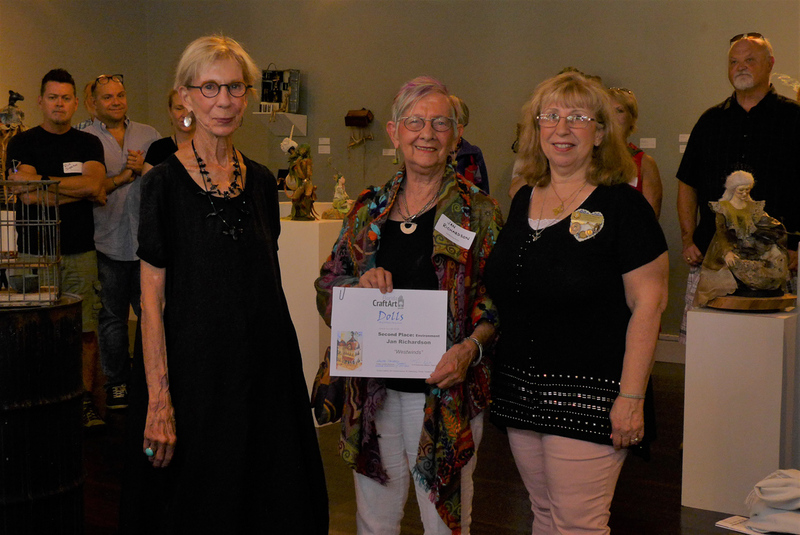 Awards for environments were presented to Aleisha Prather for “Spellbinding Library” (first place) and to ceramic artist Jan Richardson for “Westwinds,” a two-story Victorian mansion. A couple of tiny doll children on the mansion’s porch evoke the quintessential neo-Gothic period and the romanticism of that era. From 1977-2006, Jan had a large studio called Windy Meadows Pottery in Maryland where she and artisans working for her made delightful ceramic abodes highly sought after by collectors. 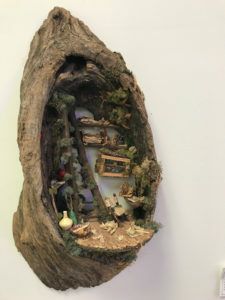 She only occasionally makes a house these days as she has become interested in ancient Asian and aboriginal cultures, as well as wood- and soda-firing. 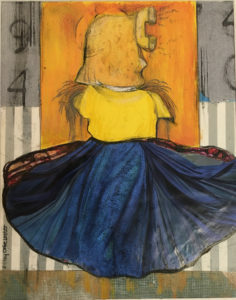 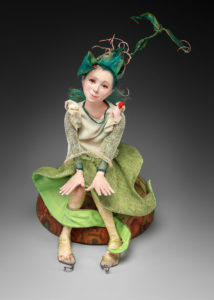 Her studio is at the Morean Center for Clay, and she resides in a charming cottage in Kenwood, St. Petersburg, Florida. On Sunday, July 8, at 2 p.m., there will be a lecture “Secrets of Doll Collecting” presented by Martha Simmons, a doll collector from Ft. Myers who is the President of the Southwest Florida Antique Study Guild and former regional director for UFDC. 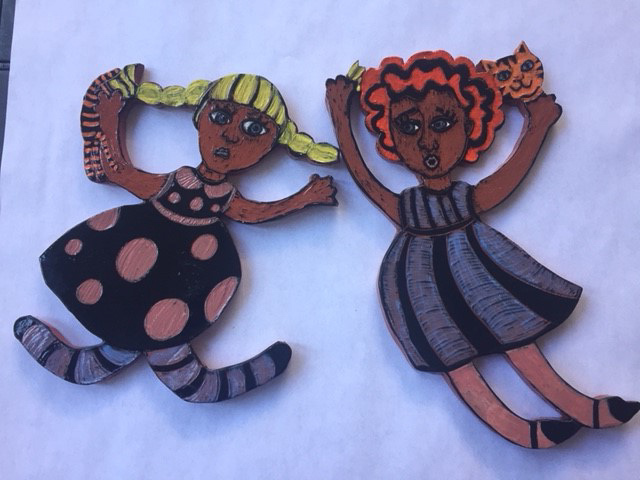 On Sunday, July 15, at 1 p.m. there will be a doll-making workshop, tickets can be purchased at FloridaCraftArt.org. 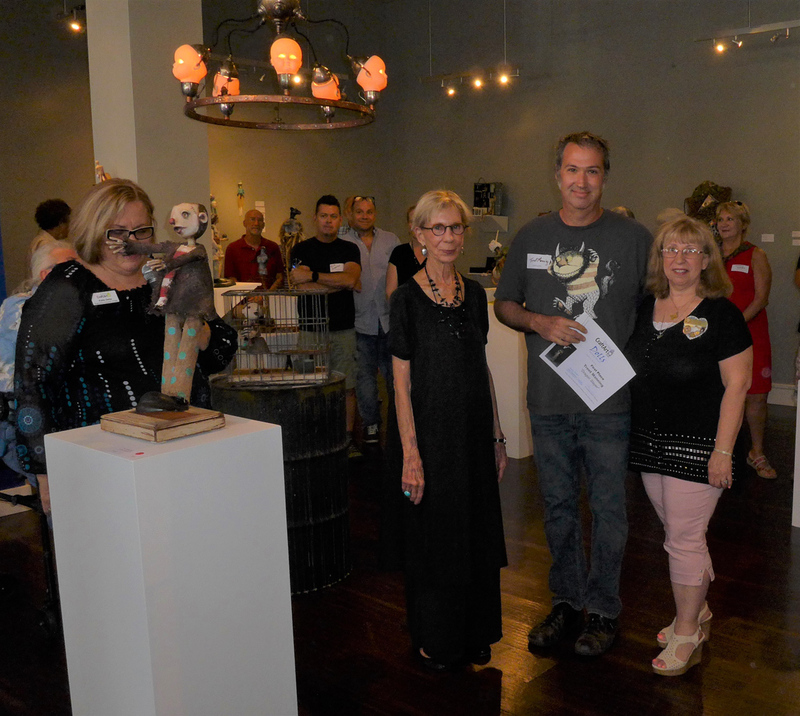 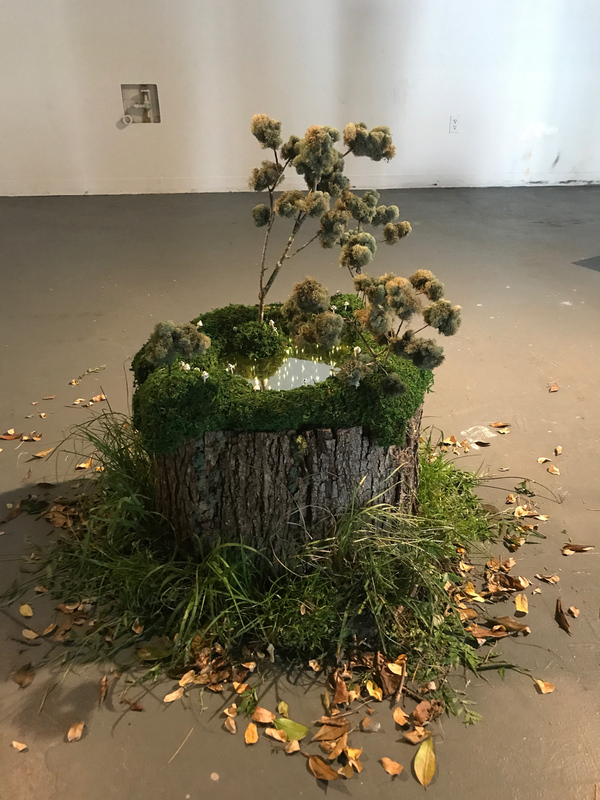 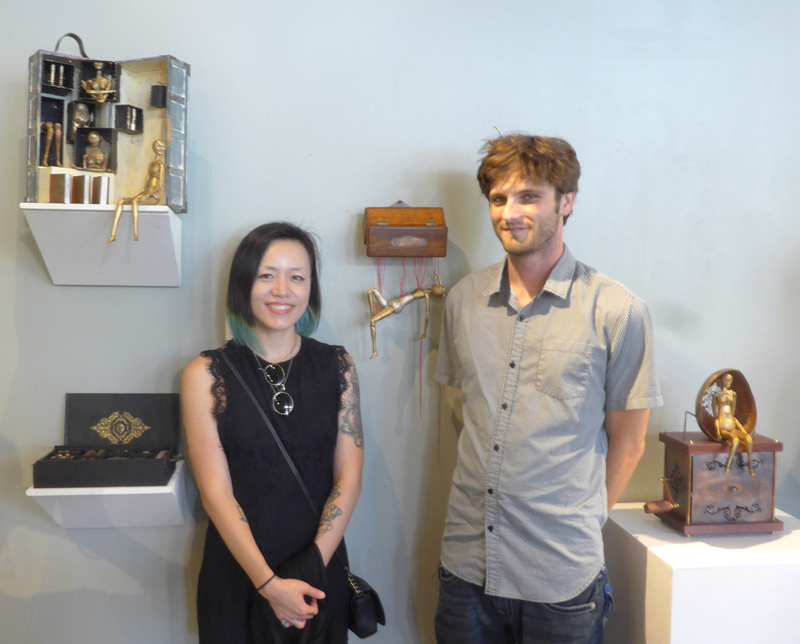 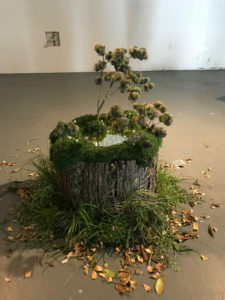 On Saturday, July 28, 5:30 to 7 p.m., the People’s Choice Award will be presented at the closing reception. 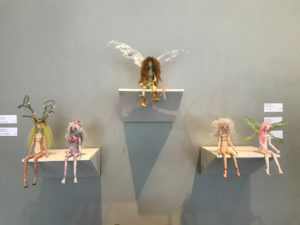 The People’s Choice Award is selected by the visitors to the gallery who vote for their favorite doll. Presenting sponsors are Jeannine Hascall and RE/MAX METRO.